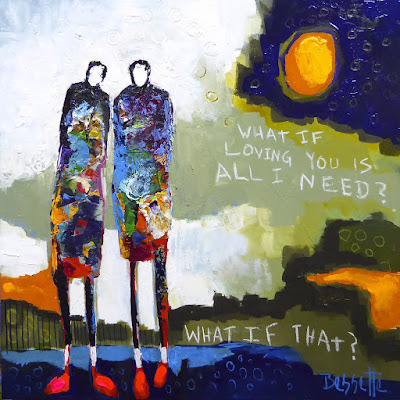 Jeanne Bessette at Mirada Fine Art, 'All I Need,' Acrylic on Canvas, 30" x 30"
So states a Native American proverb. 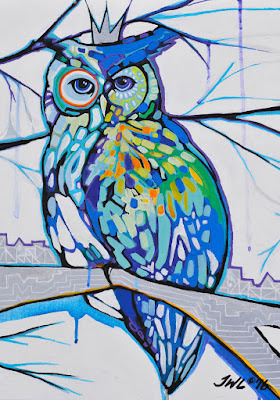 And visual stories are no exception to that ancient wisdom. 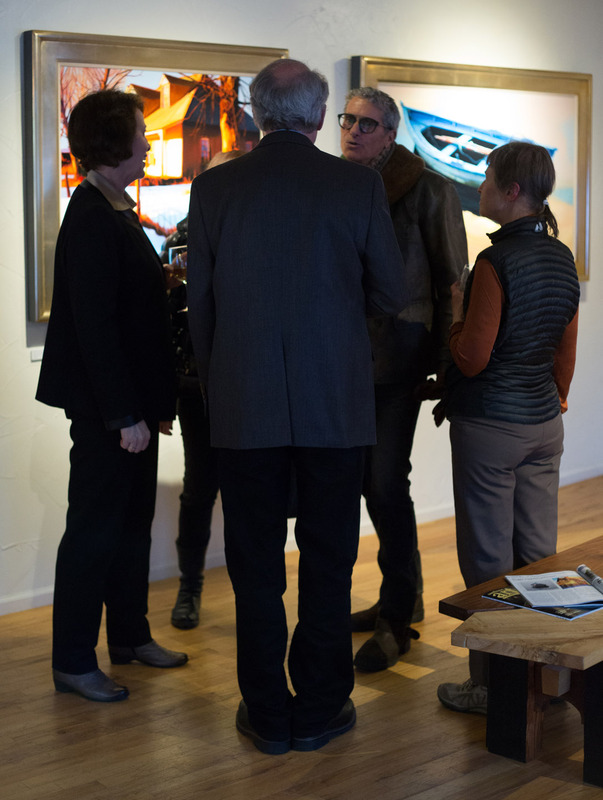 Often, artists hesitate to explain the thought process behind their work, preferring to have each viewer draw their own conclusions. Frequently, art is a spontaneous expression, with no clear outcome when begun. 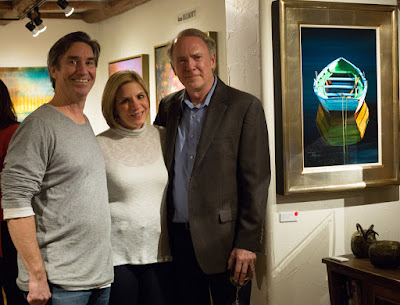 In a very unique exhibition at Mirada Fine Art, however, the story behind the art and its creators will be on clear display. 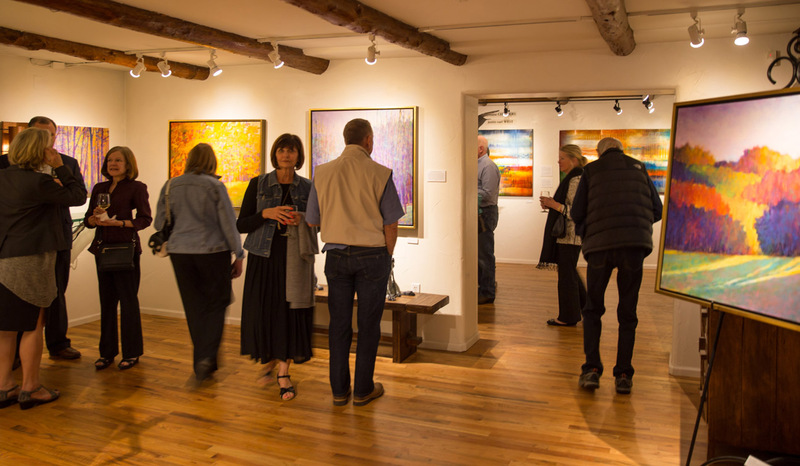 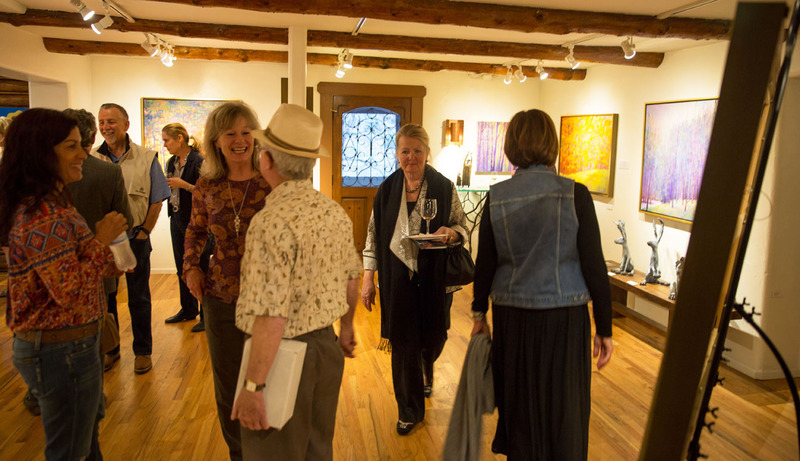 Numerous works by many of the gallery’s core artists, including nationally-acclaimed North Carolinian Jeanne Bessette and Mirada’s newest artist, Coloradan Janice Suggs, will be accompanied with explanations on how each piece was born, how it was developed, and why. For instance, sculptor Michael McLaughlin explains that his whimsical ‘Squirrel and Oak’ piece began as an homage to the furry friends surrounding his Connecticut studio and foundry. 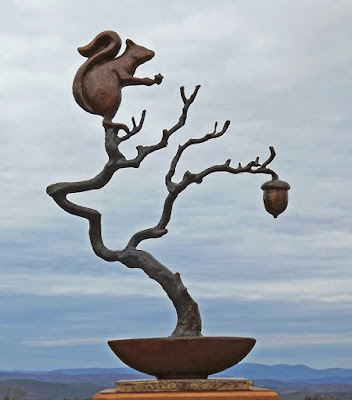 Having previously fostered two baby squirrels, which when healthy and strong had been returned to the forest, McLaughlin was inspired to recreate the high-wire acrobatics of the creatures. 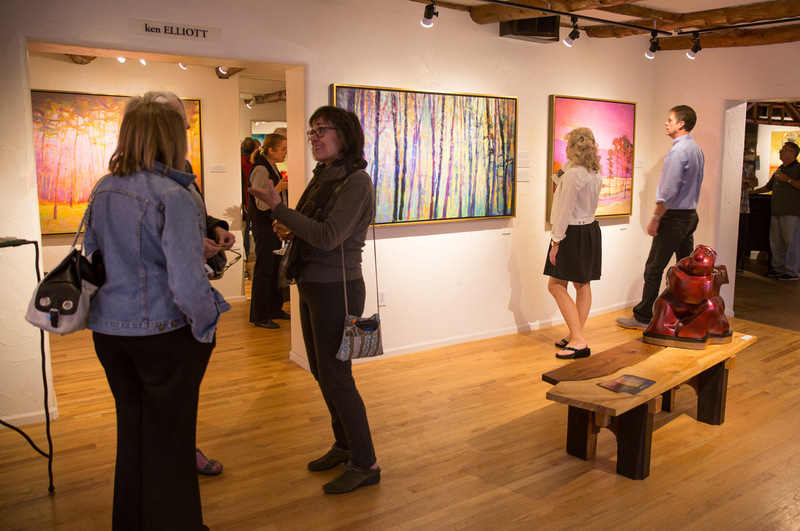 Housed in a steel Quonset style building, a hickory tree has spread a beautiful canopy over much of the workshop. 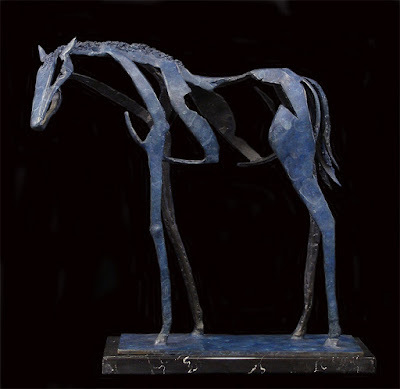 While working on the sculpture, a squirrel with a ravenous appetite for nuts lingered in the tree above the studio and unceremoniously rained a seemingly infinite number of shells clanging down upon the steel structure. 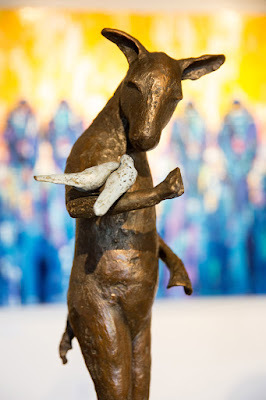 This inspiration/torture lead Michael to include an oversized nut in his fanciful piece. 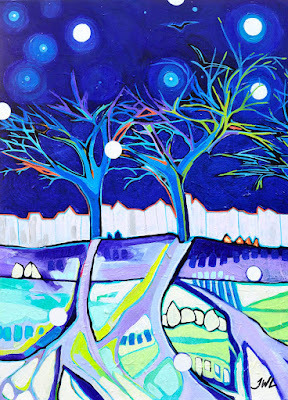 Janice Sugg at Mirada Fine Art, 'Yellow Light Through the Water,' Acrylic on Canvas, 16" x 16"
Painter Janice Sugg will explain how her painting ‘Yellow Light Through the Water’ was inspired while living on a farm in Longmont, gazing into shimmering light reflecting from irrigation water on full moon nights, as well as why the horizon is a reoccurring theme in her work. 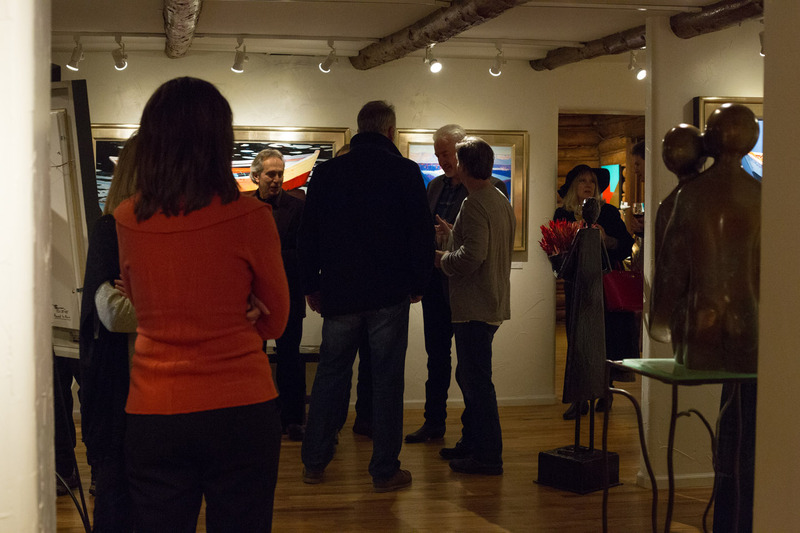 Throughout Mirada Fine Art Gallery other anecdotal explanations will be highlighted with corresponding artwork during the ‘Storytelling’ exhibition, which will run October 15 – November 6, 2016. 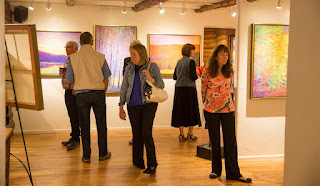 An opening reception will be held on Friday, October 14th from 6-9pm. William Barnhart at Mirada Fine Art, 'The Point of Relaxation,' Oil on Canvas, 48" x 48"
Lyudmila Agrich's 'Summer Night in Paris' and Larisa Aukon's 'Moondust' paintings at Mirada. 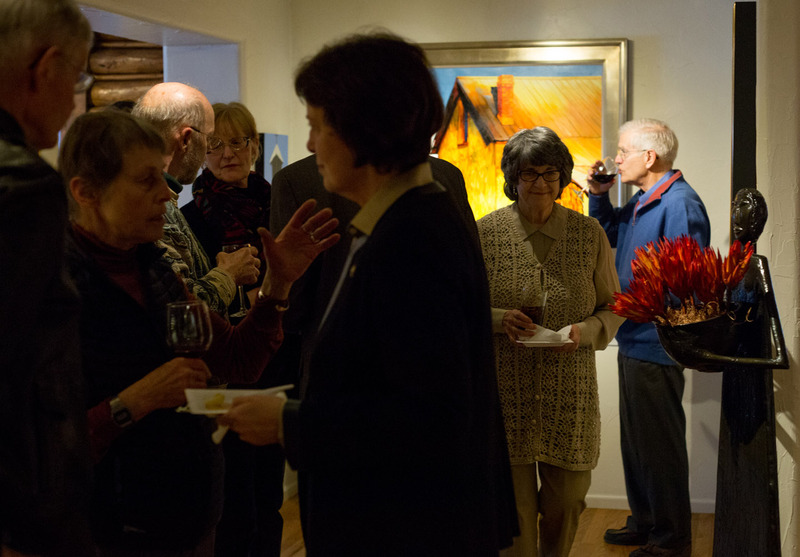 Lyudmila Agrich and Larisa Aukon are both Eastern European transplants, now residing in the western United States. 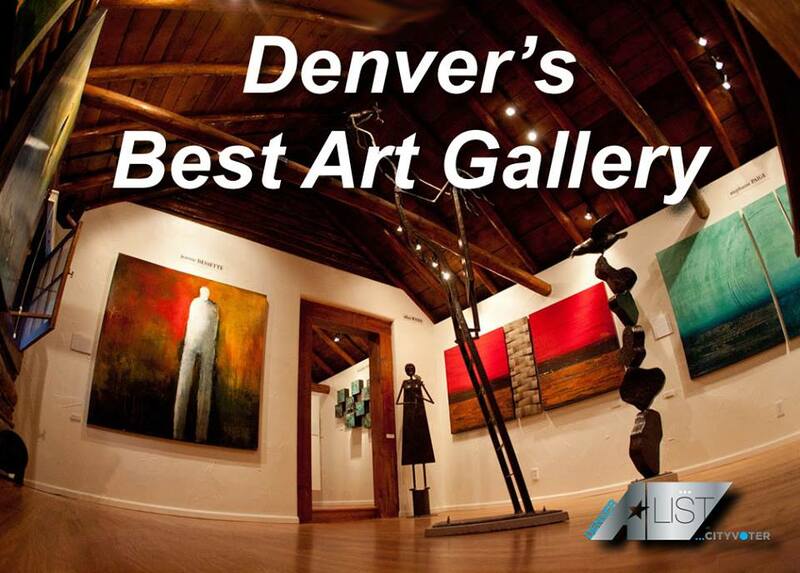 Frequently featured in national art publications, their talent has brought them tremendous attention and success. 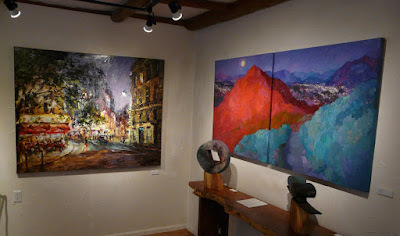 They both also happen to be wildly popular artists shown at Mirada Fine Art Gallery. These creative powerhouses will come together at the gallery in one magnificent exhibit, entitled ‘citySCAPES,’ opening on August 26th. Larisa Aukon at Mirada Fine Art, 'Lucid Dream,' Oil on Linen, 30" x 40"
Combined with incredible inherent skill and classical training, both artists have become masters at capturing the underlying glow and emotion of the urban landscape. Born in Russia, Lyudmila Agrich’s family settled in the port city of Odessa in southwest Ukraine, stunningly located by the Black Sea. 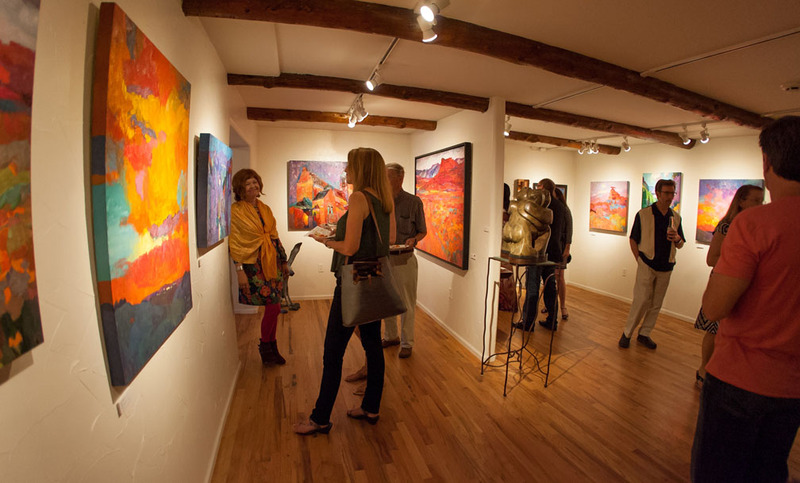 Years spent in music and fine arts schools as a child led to a college degree in Architecture and Fine Arts. 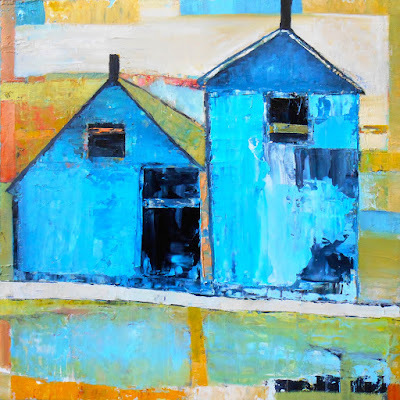 After her move to the U.S. (she now resides in Denver) she pursued her Architectural career, but replaced her drafting board with canvasses in 2001 when she took up painting full time. 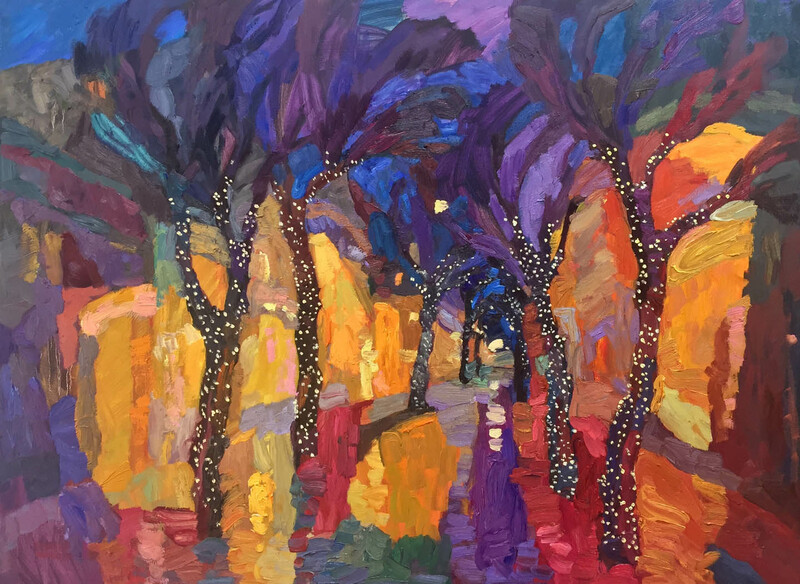 Lush swipes of oil paint with a palette knife create textural ‘visual diaries’ for Lyudmila, whose glowing work bursts with the rhythm, energy and emotion of urban scenes. 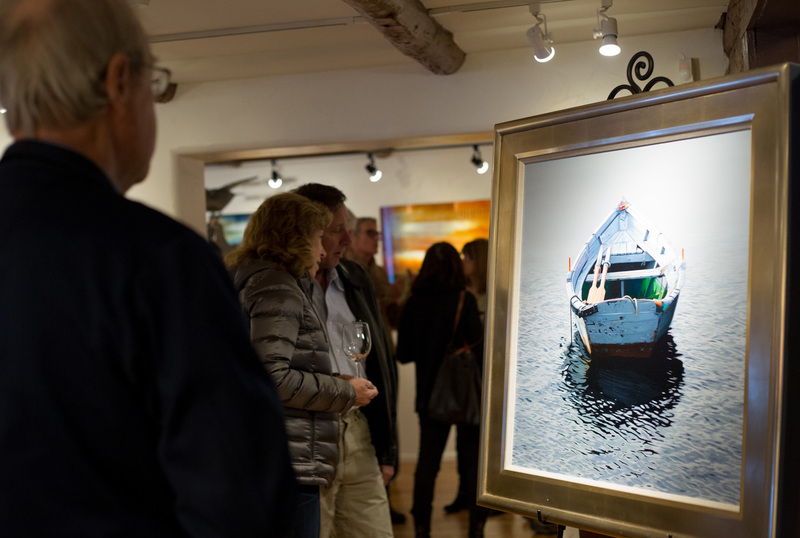 Quaint European towns and bustling metropolitan areas come to life, capturing intimate moments in ordinary life. 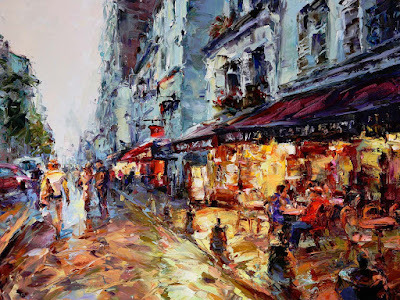 Lyudmila Agrich at Mirada Fine Art, 'Montmartre Cafe,' Oil on Canvas, 30" x 40"
A child prodigy, Latvian-born Larisa Aukon can’t remember a time she wasn’t communicating via a paintbrush. 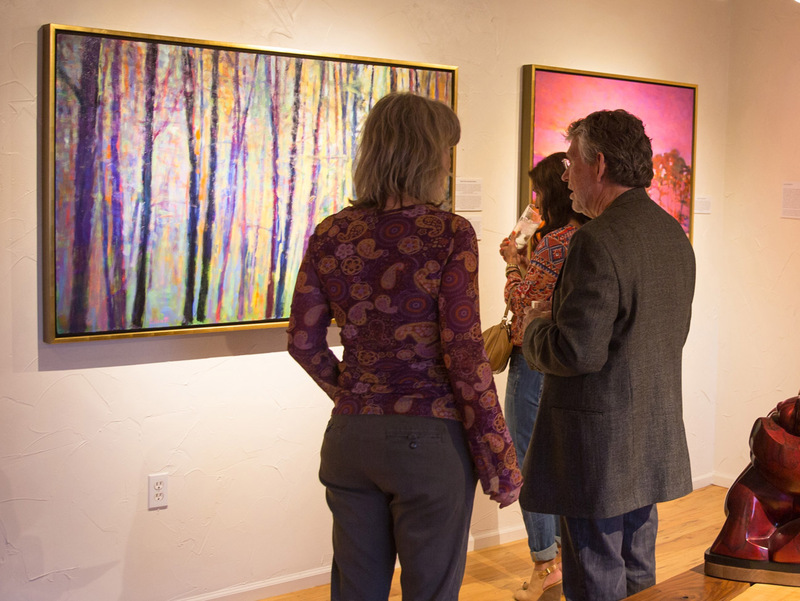 When she arrived in the American Southwest her breath was quite literally taken away by the explosion of color, dramatically affecting her work and lifting her spirit and talent to an even higher level. Vivid depictions of narrow winding streets, terra cotta rooftops, majestic cathedrals and cozy homesteads leap from Larissa’s radiant work. 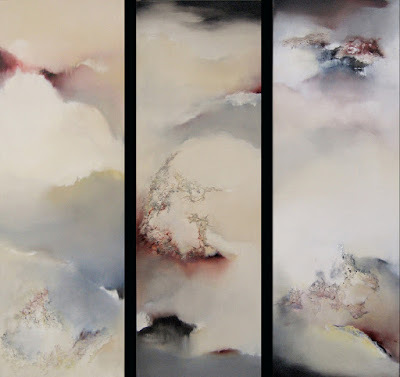 Masterfully-mixed and layered palettes create depth and brilliance, evoking a visceral reaction from each viewer of her lush pieces. Bold strokes of color, balanced composition and changing hues are hallmarks of her critically acclaimed work. 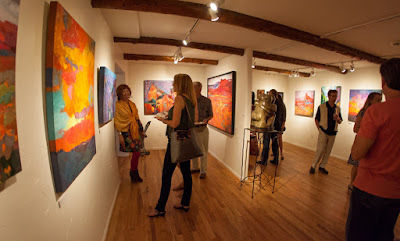 This remarkable exhibition at Mirada Fine Art runs from August 26th through September 18th. 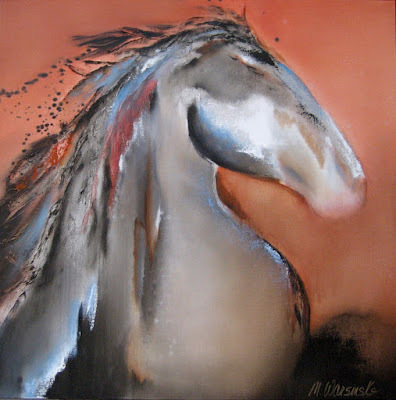 "If all the beasts were gone, men would die from a great loneliness of spirit." 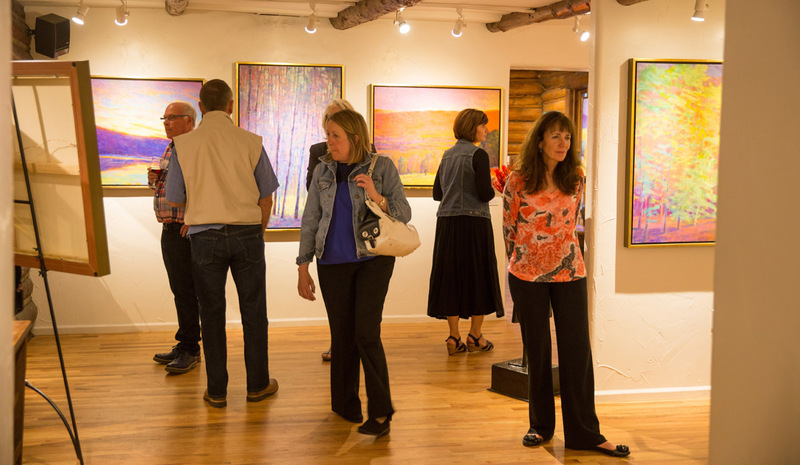 Despite periodic efforts to contain it, the wild side of Colorado always resurfaces. To celebrate our adventurous cohabitation with an amazing array of furry and feathered friends and the sometimes primitive surroundings, Mirada Fine Art will host a group retrospective entitled ‘WILD.’ Converging on the gallery from near and far, several of Mirada’s perennial favorite artists, combined with a number of artists new to the gallery, will offer their interpretation of WILD and all that entails that helps make our state utterly unique. 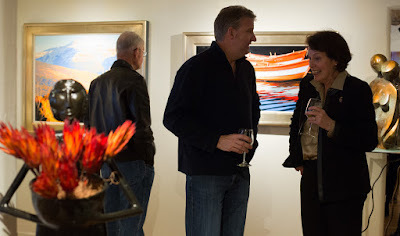 Admiring Bruce Marion's 'Tatonka-Americana' at Mirada Fine Art's 'WILD' exhibition. "This isn't about simply mirroring the wildlife we're so privileged to live among," explains gallery owner Steve Sonnen. "We've deliberately brought together an unexpected mixture of artists to reflect the free-form nature of the artists themselves." 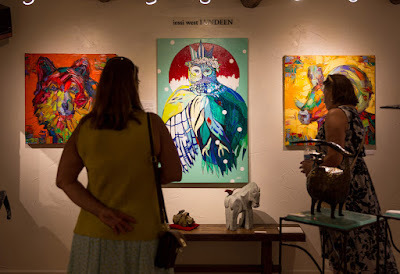 The majesty of the area will be recognized and reinvented by this eclectic and talented group of Mirada artists for an exhibit running from June 18 – July 10, 2016. 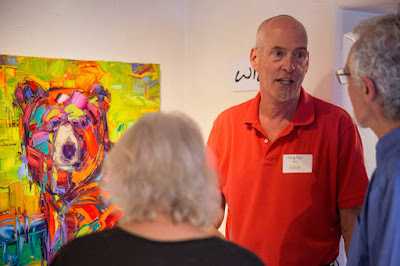 Artist Greg Dye discusses his artwork during the opening of 'WILD' at Mirada Fine Art. Two of Mirada’s most popular artists anchor the show. 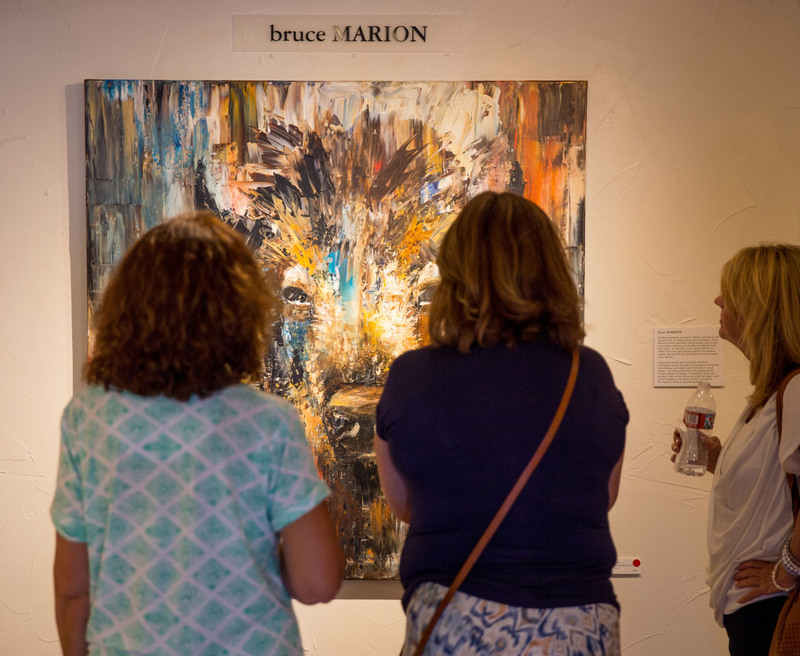 Bruce Marion begins each of his pieces with a frenetic and abstract under painting. 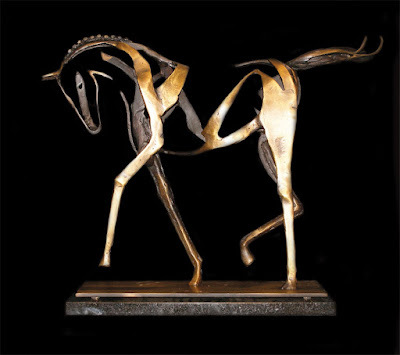 Like a sculptor chipping away, Bruce then subtracts information until a lush scene appears. 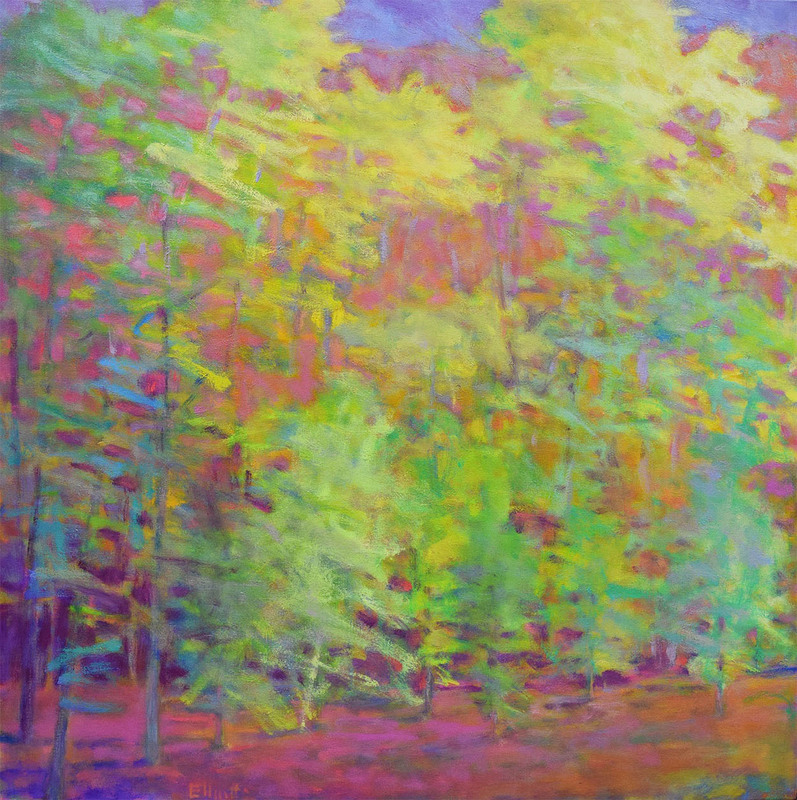 Known for his luminous landscapes, Marion most recently has turned his brush to creating powerful impressionist wildlife. 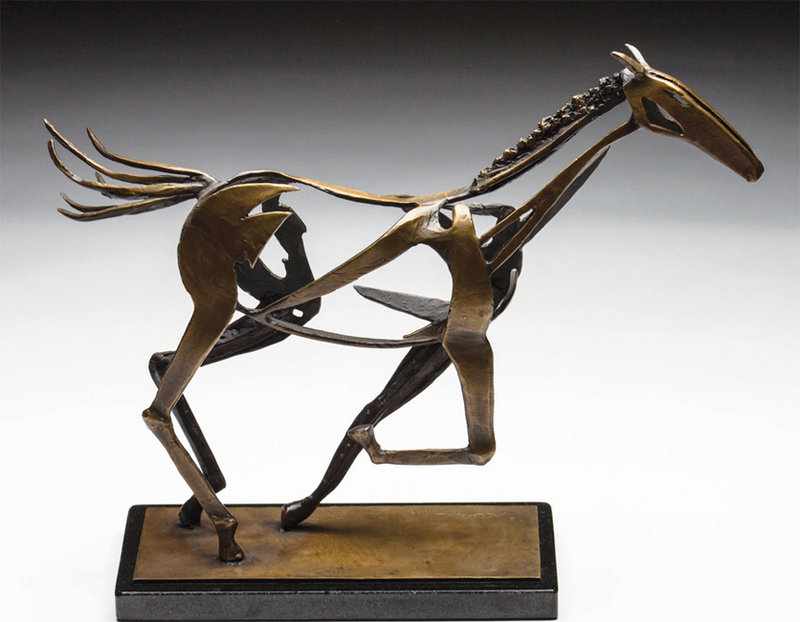 Renowned equine artist Laurie Justus Pace will lend her passionate style, offering new work alive with graceful movement and power. She describes her process akin to pareidolia, the term used to describe the phenomena of seeing animals in clouds or faces in the moon. Mary Hartman's beautiful 'Morning Turnout' at the opening reception of Mirada Fine Art's 'WILD' exhibition. 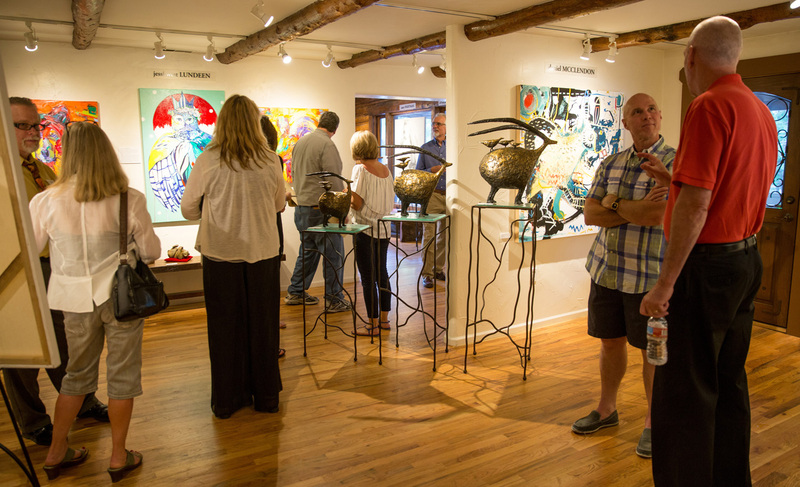 Newcomers to the gallery, Daniel McClendon, Copper Tritscheller, Mary Hartman, Jessi West Lundeen and Greg Dye bring their own free-spirited take on the West. 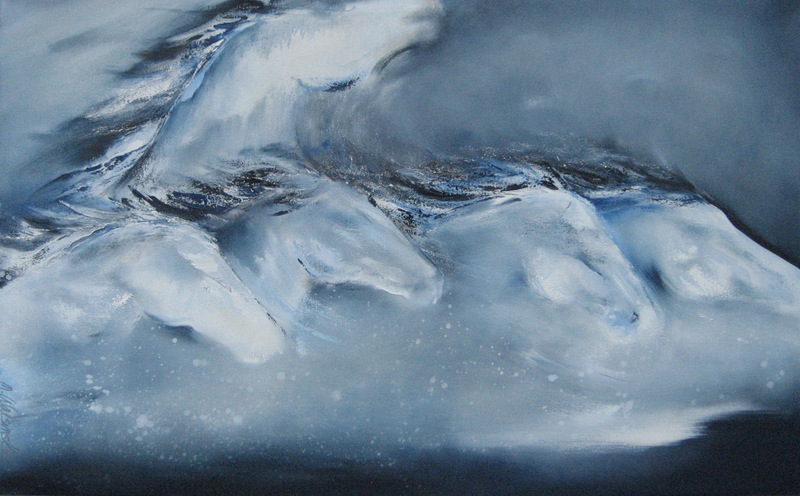 Animals are always the central figure in a Daniel McClendon painting. 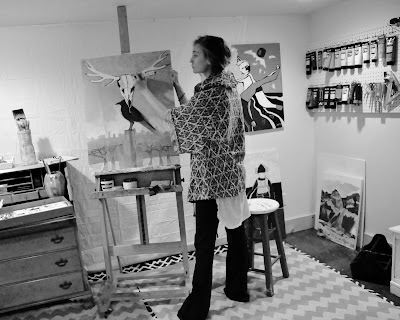 From a free form and chaotic beginning black and white under-painting, strong color and pattern take over and the animal appears, taking on the role of a totem—a spirit being to help us guide on our life journey. 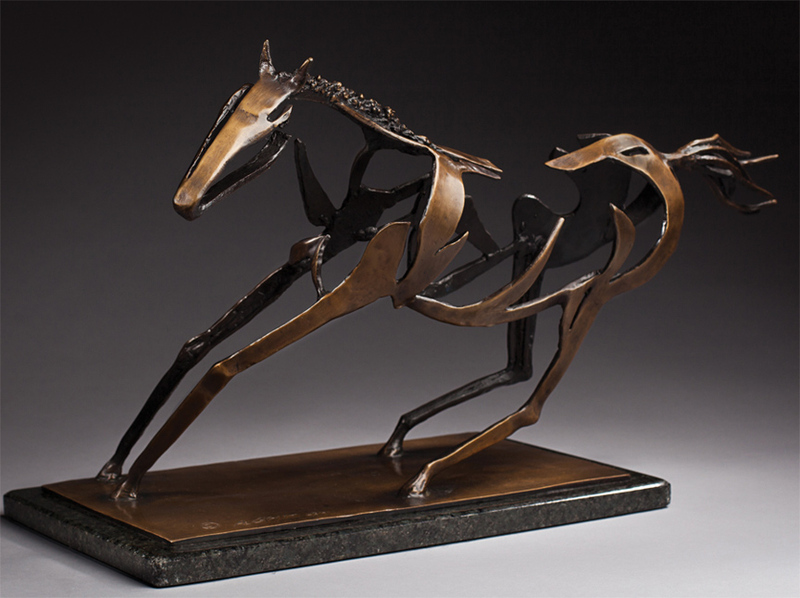 Sculptor Copper Tritscheller’s favorite subjects are the ‘misunderstood creatures,’ particularly bats and burros. Her bronzes push the boundaries between animal and human; hard-working and loyal burros teeter precariously on pedestals and bats, crucial to so many eco-systems, sport oversized wings suggestive of comic book heroes. The artwork of Greg Dye, Jessi West Lundeen, and Mark Yale Harris at Mirada's 'WILD' exhibition. 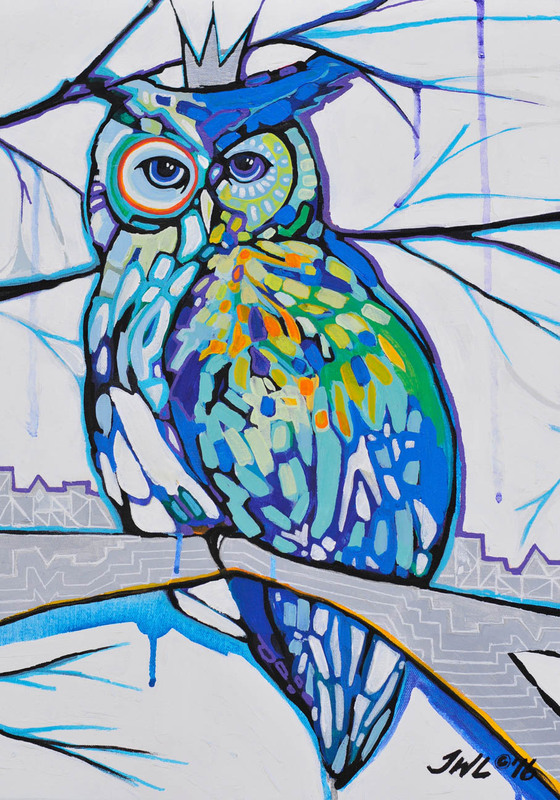 Denver-based artist ,Greg Dye, creates wildly vibrant wildlife paintings and landscapes that don’t attempt to capture a realistic stagnant moment, but rather the inherent motion and spiritual energy of his subjects. 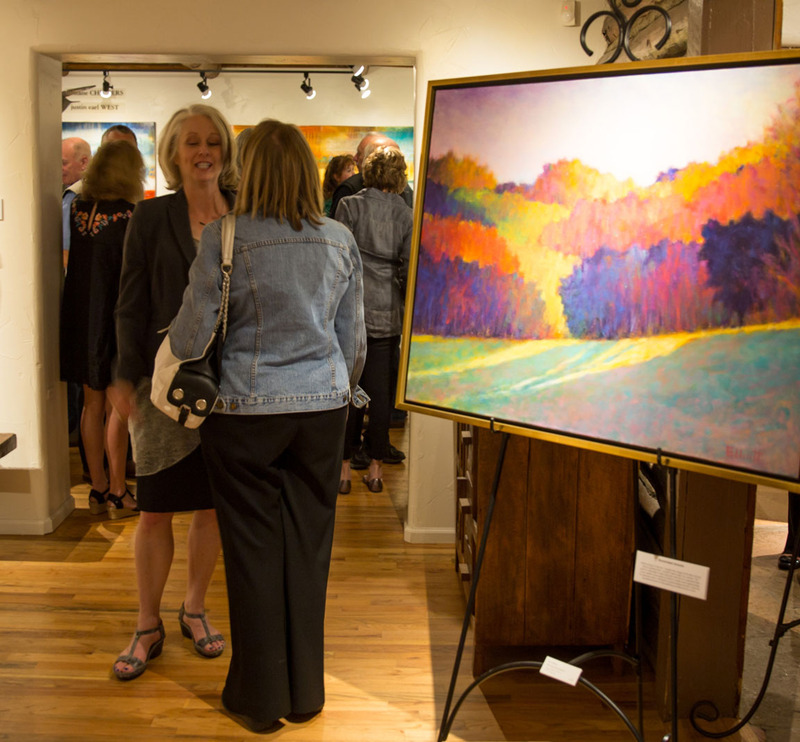 Another Colorado artist, Jessi West Lundeen developed an abstracted style to capture the essence of the magnificence of her surroundings. 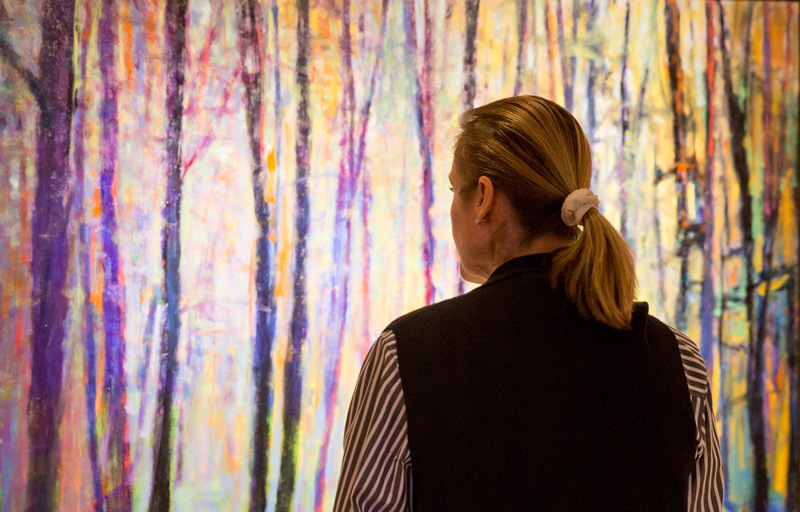 Her latest body of work uses saturated color and bold lines to dissect the dichotomy between nature and humanity, often blending the two into an integrated piece. 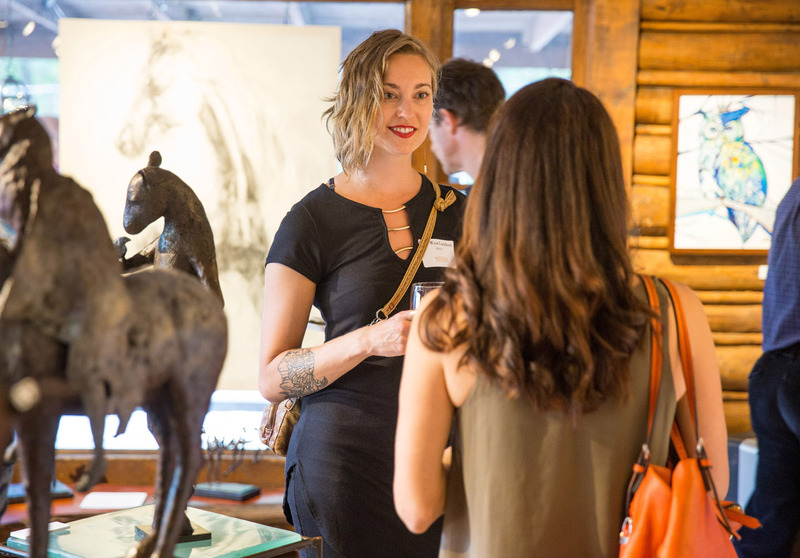 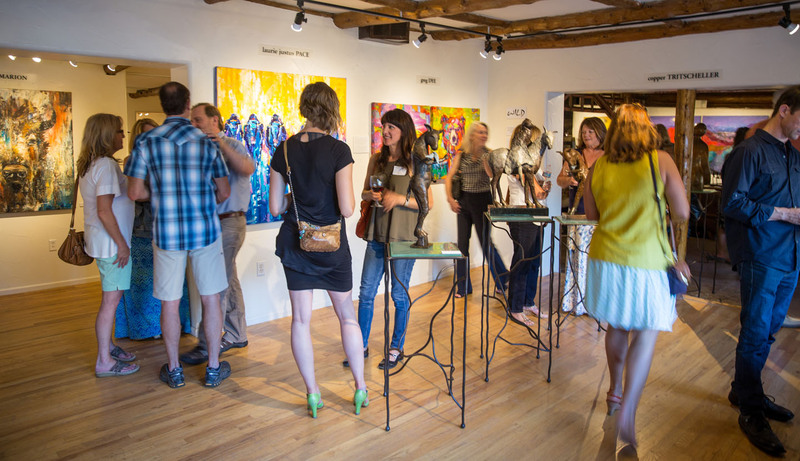 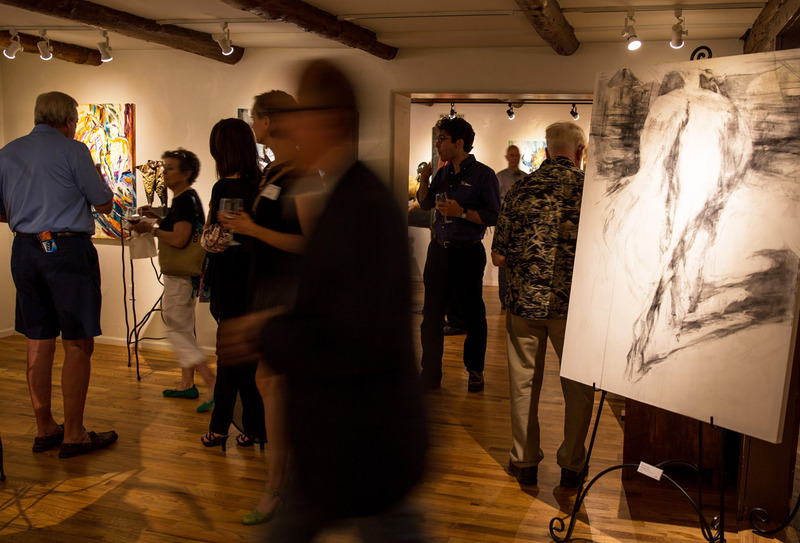 Artist Jessi West Lundeen discusses her artwork at Mirada Fine Art's 'WILD' exhibition. Together, these talented artists should provide us all with an unexpected and spectacular journey exploring our wild life, leading to an even deeper appreciation of all the wildness nature has to offer. 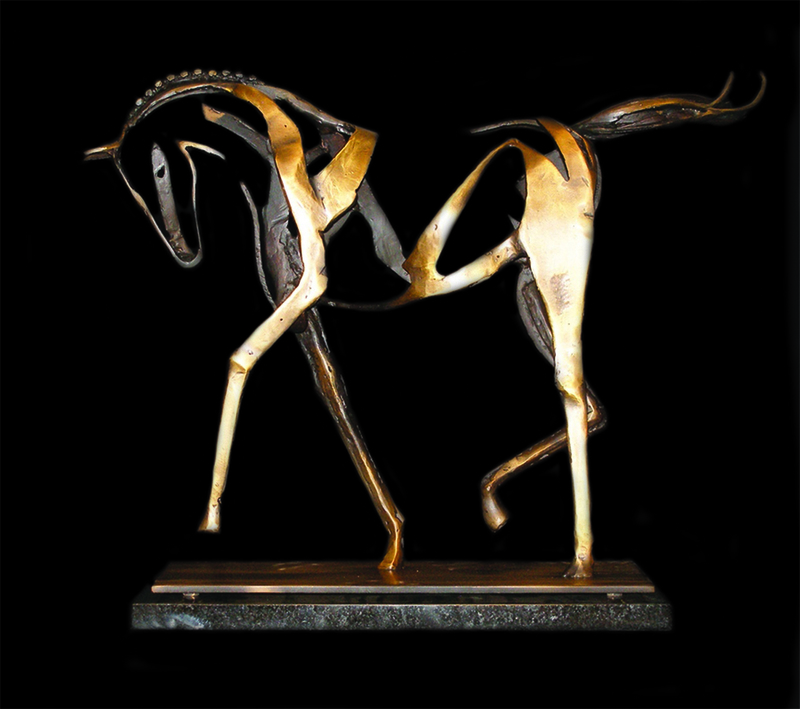 Mirada Fine Art's 'WILD' exhibition runs from June 18th - July 10th. 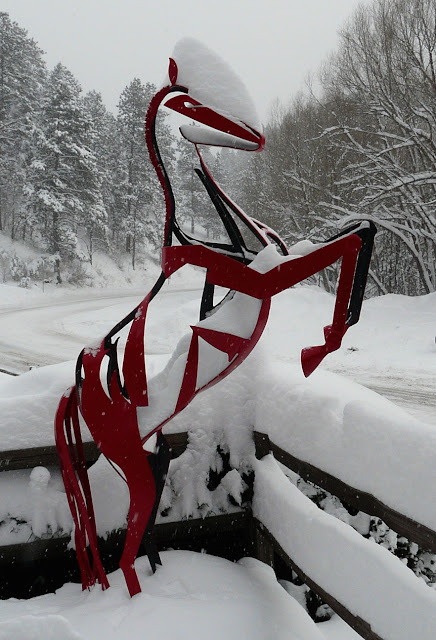 Russell Whiting's spectacular steel sculpture 'Walking Angel' always looks amazing...but check it out in the snow in front of the gallery today...amazing! This sculpture measures 74" x 50" x 30". 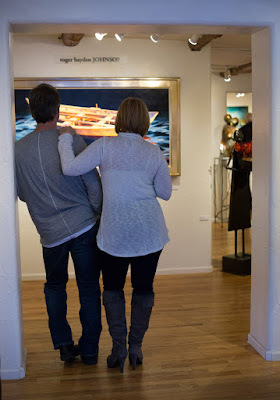 Come by Mirada Fine Art to check it out in person! 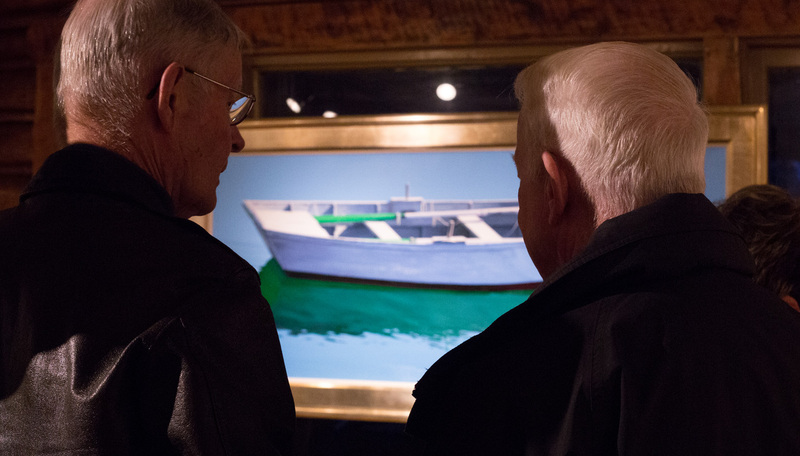 New exhibit showcases artist Ken Elliott's mastery of the use of color. 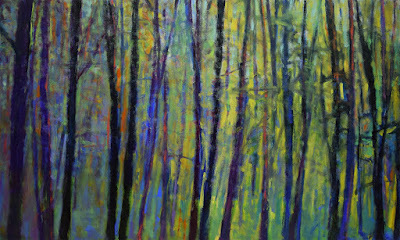 Ken Elliott at Mirada Fine Art, Through the Forest, Oil on Canvas, 36 x 60"
‘Nature is where all the inspiration and colors for a lifetime are always waiting.’ This is the conclusion talented painter Ken Elliott has come to after over forty years in the art business. Four decades spent observing technique, and establishing a wealth of understanding on the use of light, lines and color, led Elliott to develop his own compelling style. 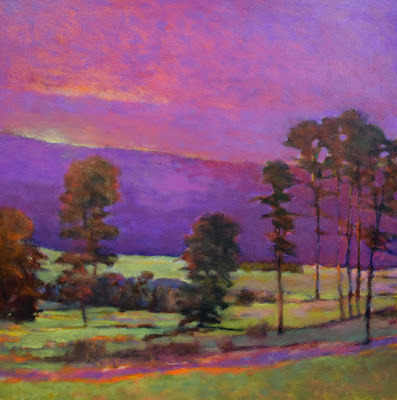 Ken Elliott at Mirada Fine Art, Haze in the Distance II, Oil on Canvas, 40" x 40"
Altering, perfecting and abstracting his perception of nature, rich bold color and vibrant shapes emanate from Ken Elliott’s canvasses. 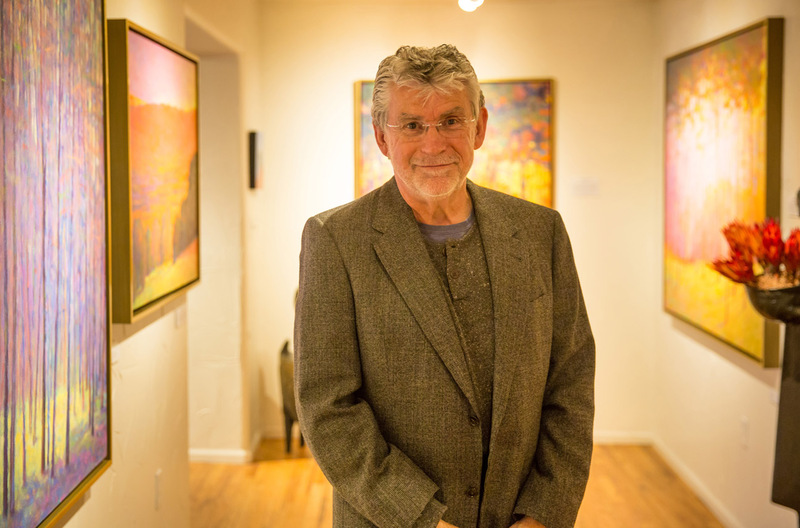 The fascination with the endless palette provided by nature inspired his latest collection of work, ‘Color,’ an exhibition opening at Mirada Fine Art on Friday, May 6. 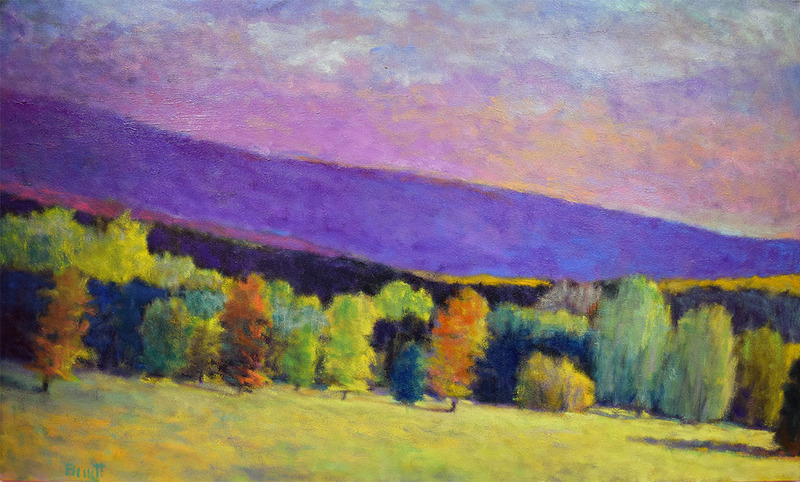 Rendered in vividly modern hues, his landscapes simultaneously convey powerful movement and deep serenity. ‘I don’t try to recreate nature (even Monet said he never got that right). 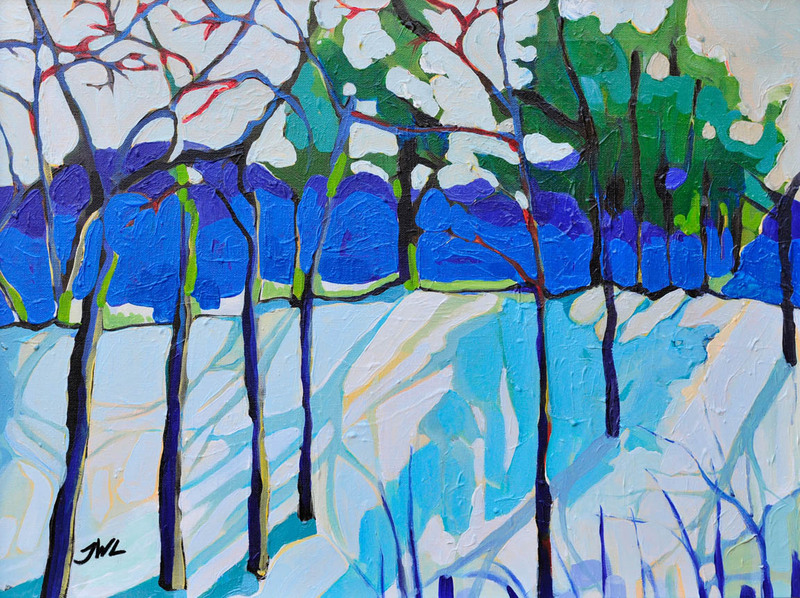 Instead, my work is a simplification and exaggeration of elements found within a landscape,’ Ken tells us. 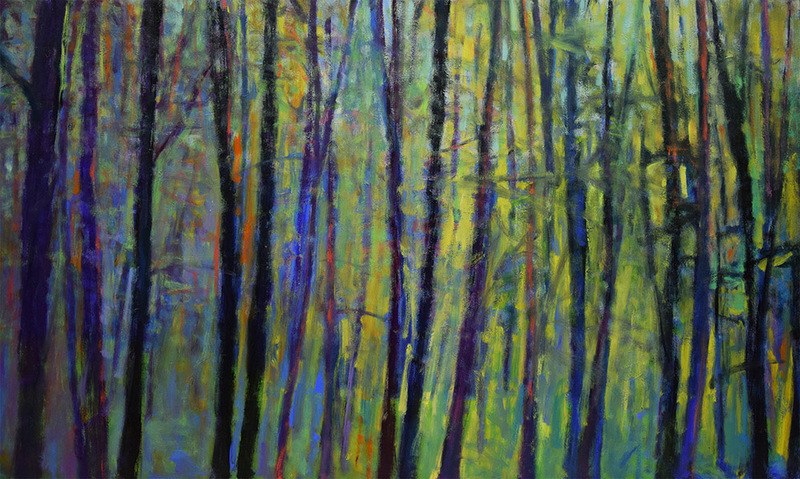 Ken Elliott at Mirada Fine Art, Forest in Greens & Mauves, Oil on Canvas, 40" x 40"
Painting is not a linear process for this artist. 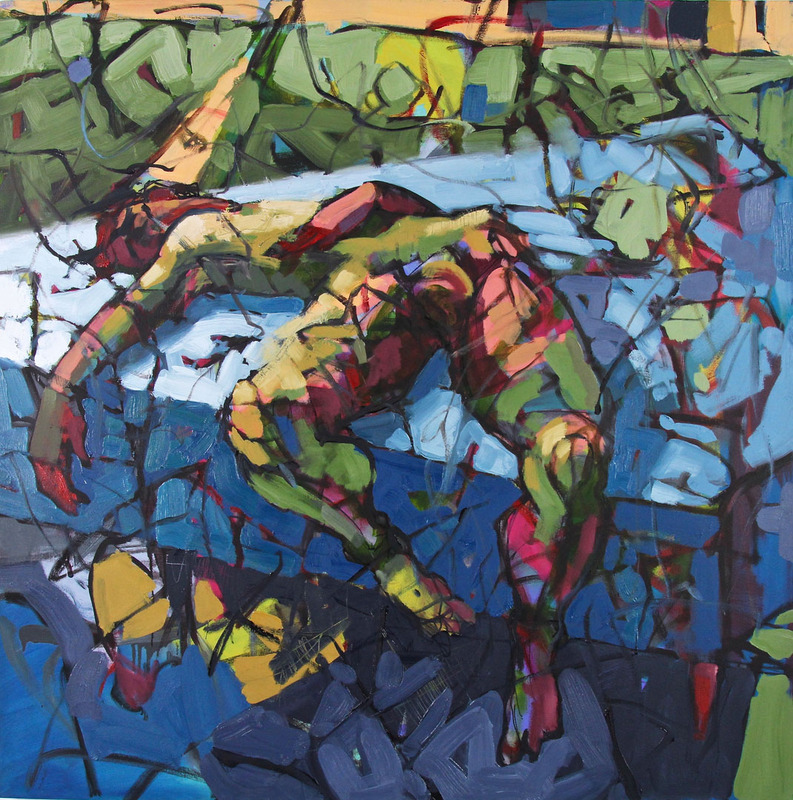 He usually works on several pieces at a time. 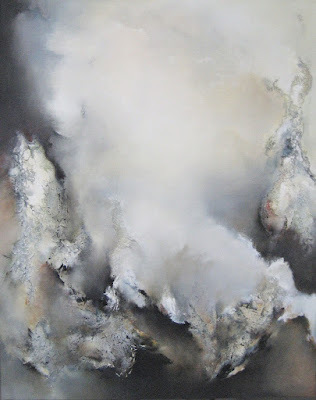 Elements of one piece spur experimentation in another. Jumping between work with oil paints and pastels allows differing emphasis on line structure, color depth and illumination. 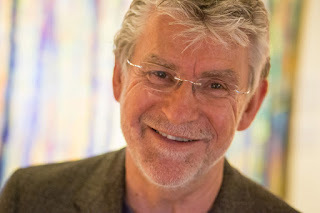 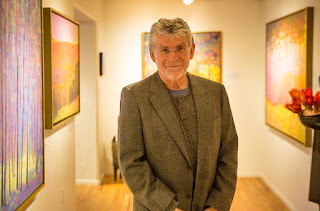 And decades of experience have taught Ken to not discount the potential of a ‘mistake.’ Just as in nature, Elliott has discovered that an imperfection can often be the most visually interesting component. Ken Elliott at Mirada Fine Art, Meadow Cascade, Oil on Canvas, 36" x 60"
The artist’s work stands independent of any specific place or time. 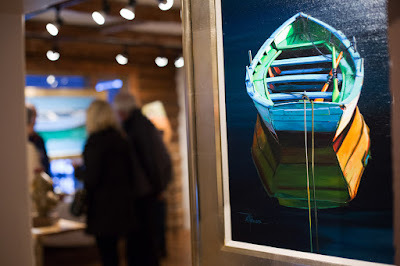 They are a combination of the glory Ken Elliott sees in the world around him, and his own vivid imagination. Grounded in unifying illumination, each piece somehow portrays both a kinetic energy and inherent calm. 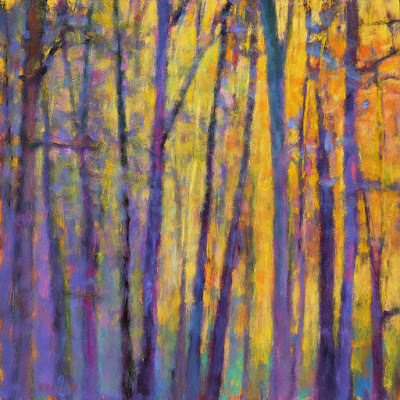 Ken Elliott at Mirada Fine Art, Through the Purple Woods, Oil on Canvas, 24" x 24"
Roger Hayden Johnson unveiled his new 'first LIGHT' exhibition at Mirada Fine Art on Friday night, March 18, 2016. Although it had been snowing all day long, Mirada was packed with admirers of his remarkable work. Here are some photos from that amazing evening. 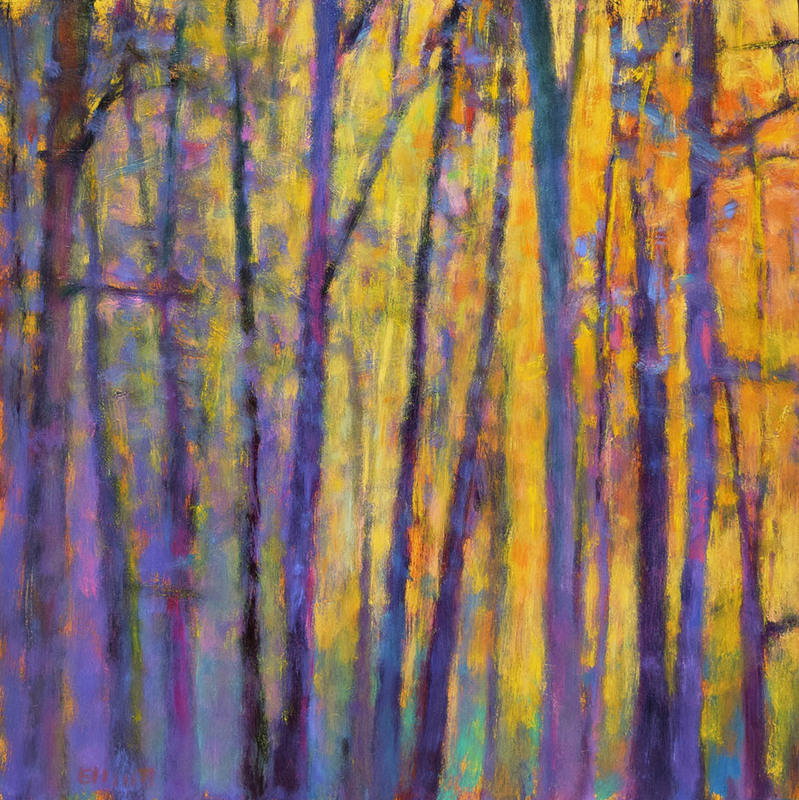 'first LIGHT' will be on display at Mirada through April 10th. Roger Hayden Johnson at Mirada Fine Art, Opening night of 'first LIGHT' exhibition. 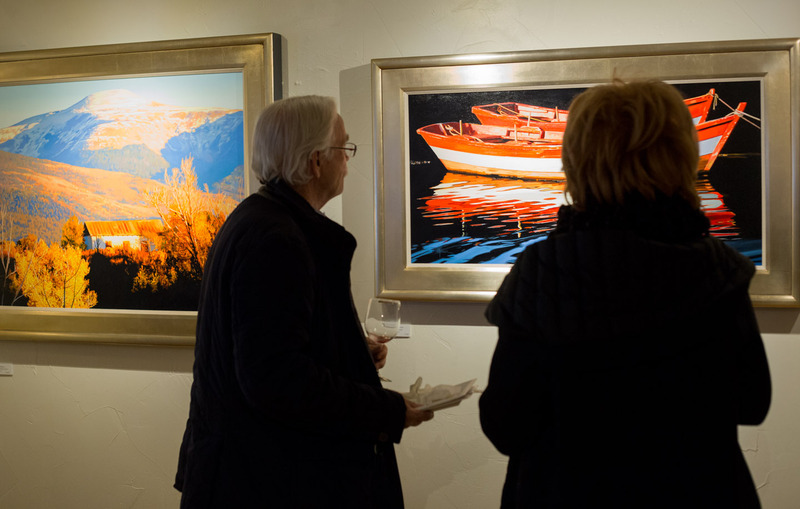 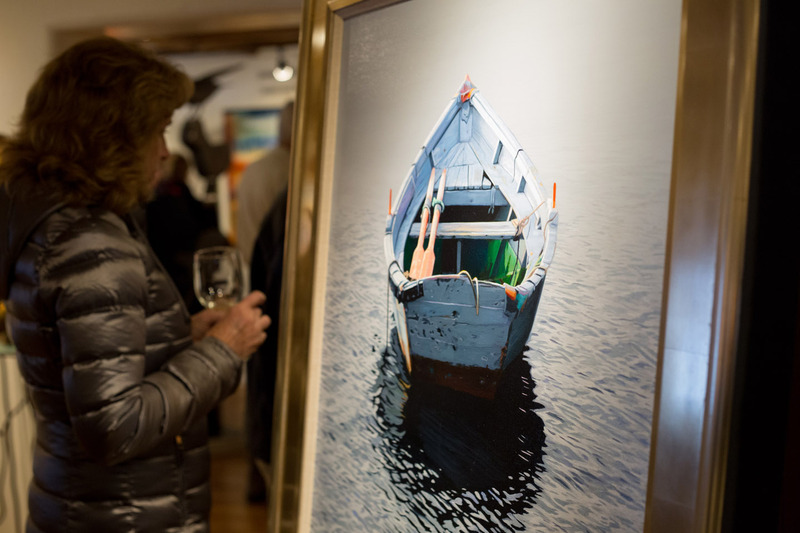 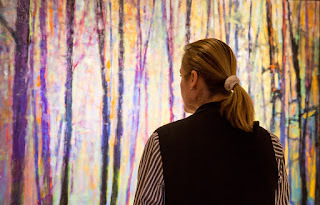 Admiring the artwork of Roger Hayden Johnson at Mirada Fine Art during the opening night of his 'first LIGHT' exhibition. 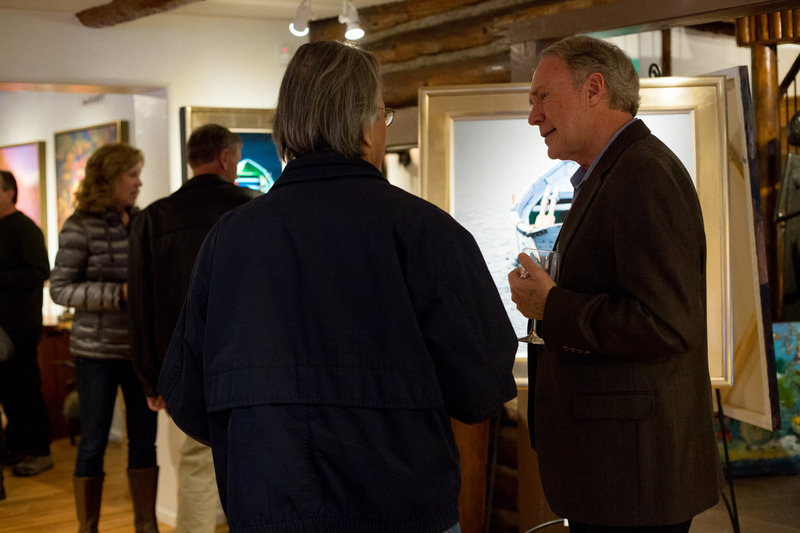 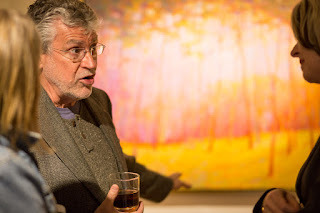 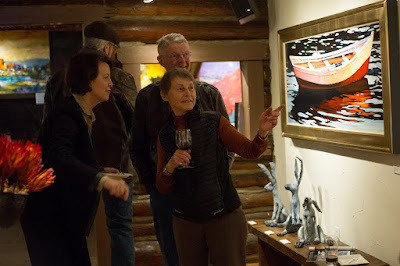 Roger Hayden Johnson discusses his artwork at Mirada Fine Art during the opening night of his 'first LIGHT' exhibition. 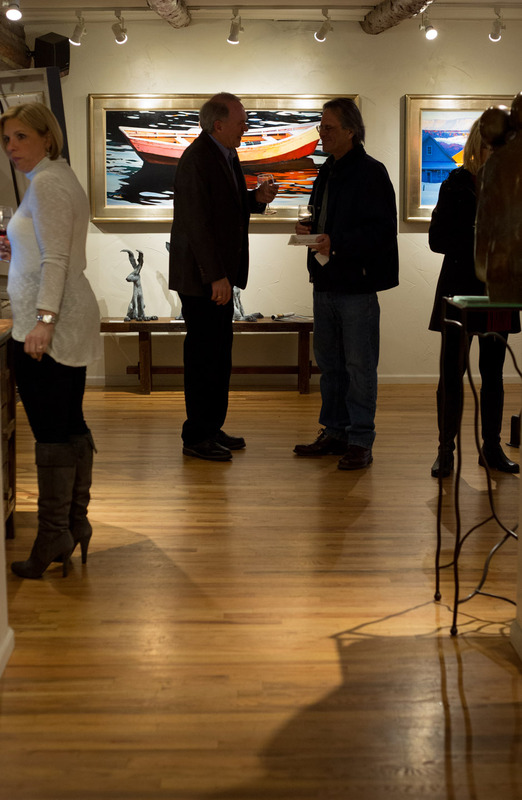 Admiring the artwork of Roger Hayden Johnson at Mirada Fine Art. 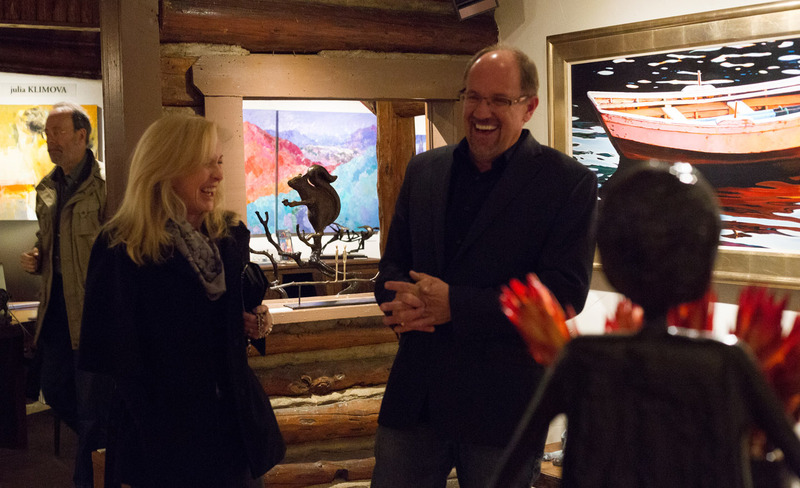 The proud new owners of Roger Hayden Johnson's 'Night Crossing.' Opening night at Mirada Fine Art. 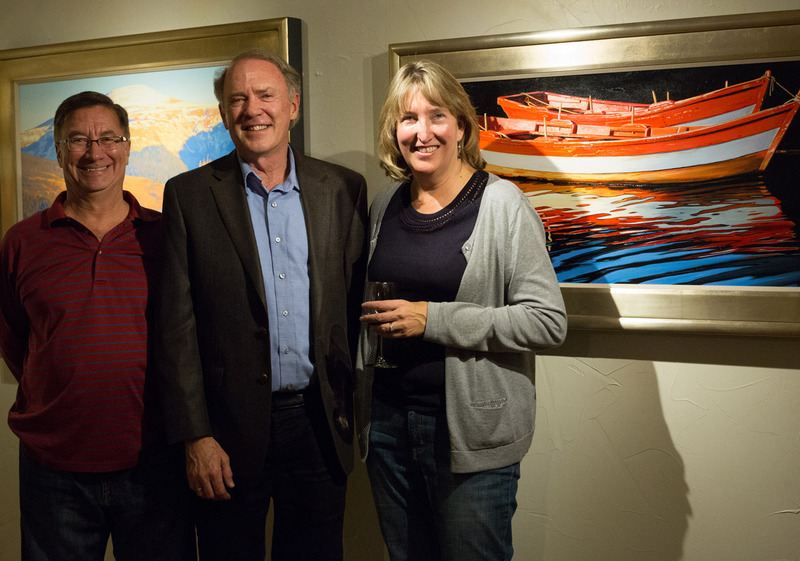 The proud new owners of Roger Hayden Johnson's 'Painted Skiff.' 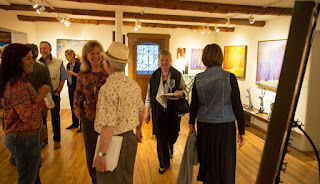 Opening night at Mirada Fine Art. The proud new owners of Roger Hayden Johnson's 'Red Rower, Red Rower' Opening night at Mirada Fine Art. 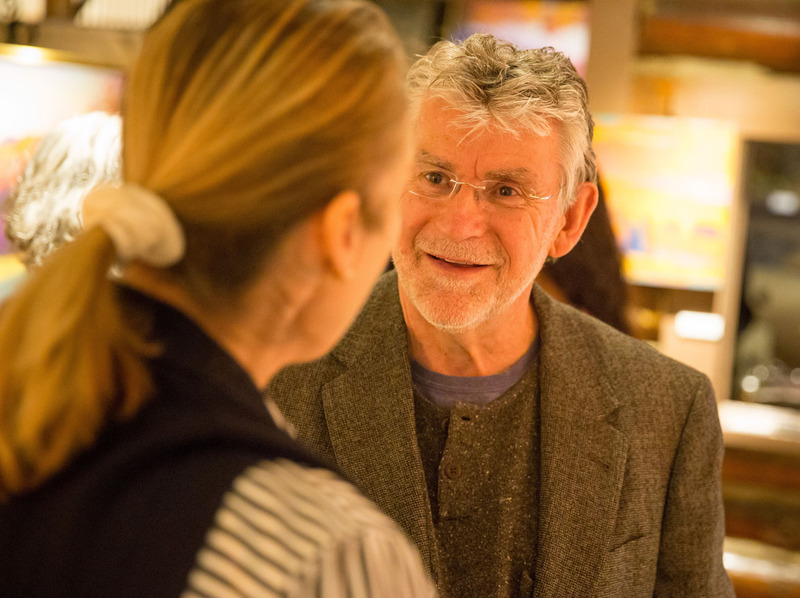 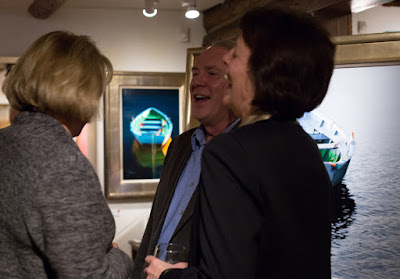 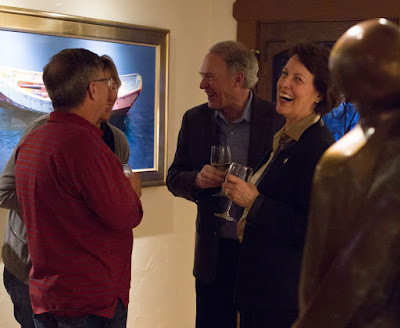 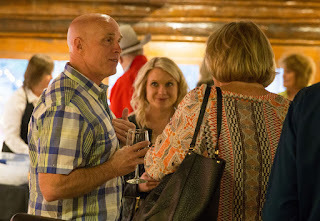 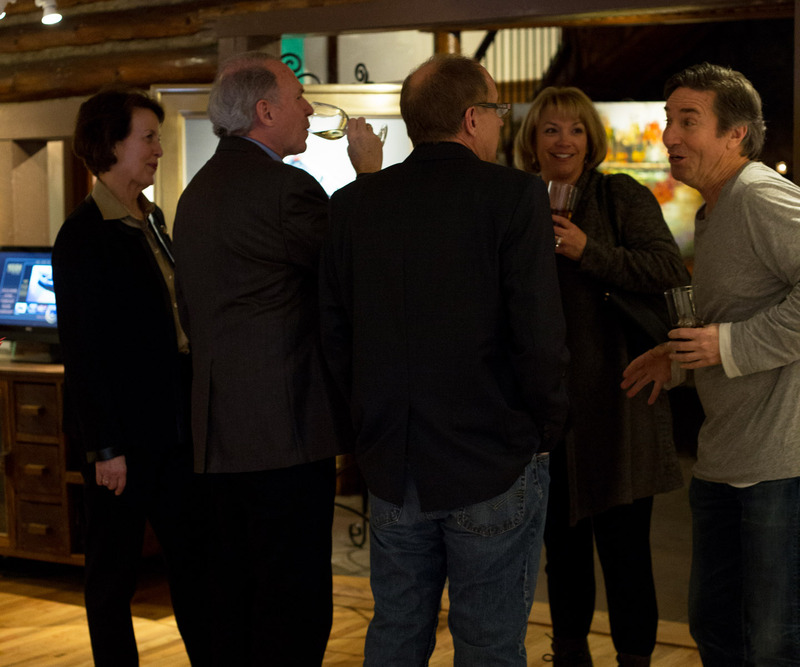 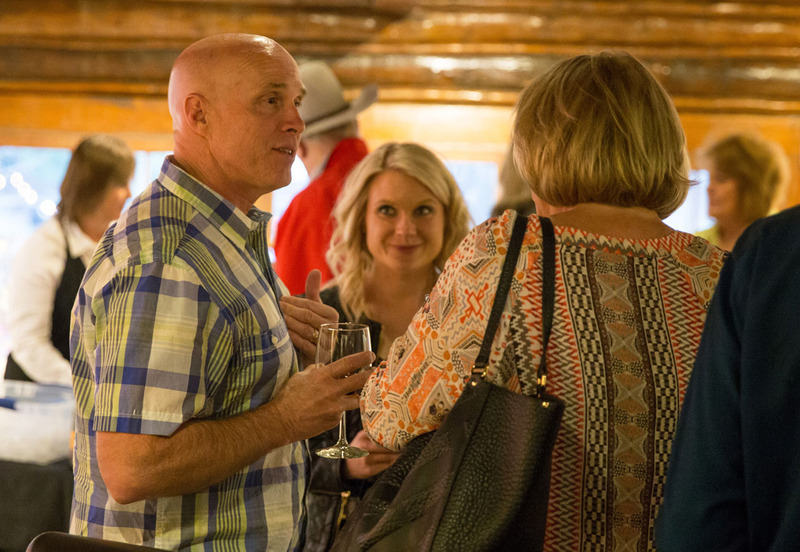 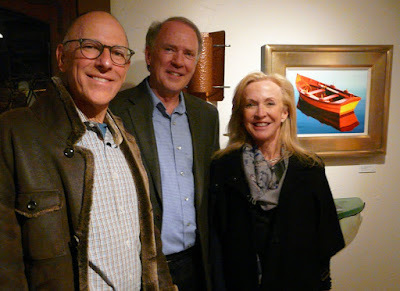 Mirada Fine Art owner Steve Sonnen enjoying the opening night of Roger Hayden Johnson's 'first LIGHT' exhibition.